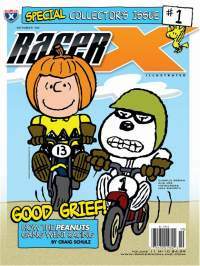 We hope you liked our first-ever special Collector's Issue of Racer X, which featured Charlie Brown and Joe Motocross (AKA Snoopy) on the cover. We went ahead and got a limited supply of stickers made of this cover, and we want to share them with you. So if you want to add this one to your collection, all you have to do is send a self-addressed stamped envelope to the address below and we'll hook you up.